← Hump Day Miscellany – Fitness Rules! Monday Monday – The Vineman Cometh! Sunday is Vineman day and I am SO excited. IronMomJenny is coming Friday and we are driving up to Sonoma for the weekend to hang out and race together. Ms. Muppet Dog will be there, too as will some folks from over at Trifuel. Too much fun. Anyone else going? Jenny has enough racing cred that she doesn’t care about her time so she’s doing this thing with me. I know she will have plenty of time to blog real time from her iPhone while she waits for me in transition and then she will get me through the run. What a lucky girl I am! Today is Monday, my normal rest day and I always appreciate a Monday when I feel I have earned it and need it. Today qualifies – my legs are tired. I rode by myself Saturday because there was a particular ride I wanted to do and I wanted to do it at my pace and I didn’t have any available riding partners so off I went to ride the Berkeley Hills via Wildcat Canyon Road. I love this ride. I loved it all the more Saturday because I had one of those experiences that affirms your faith in humanity. Anyone who reads this blog regularly knows that I can get lost in a walk in closet. Put me on a 43 mile ride on winding roads and you have a recipe for serious disaster. I had looked at the map. I had committed the major turns to memory. Did this help? Not much. I was fine until I got to an intersection I knew I was supposed to turn left. There was a sign pointing left that had the name of the wrong town for me on it, though. The only street sign I could see had the wrong name on it. I was confused. I thought I had to turn around and head back up the hill because I’d missed the intersection where I was supposed to turn (not that there had been one but, you know). I asked 2 women who were on bikes but stopped and chatting how to get to Pinehurst and they said they thought I should go left but they weren’t sure and then a man rode up the other side and they asked him. He said “go straight until you hit Skyline and then it runs in to Pinehurst”. Bliss. That was left for me so off I went. Then I got to the next intersection where 4 roads meet and got totally confused again but I finally figured it out and kept going. And then I finally got to the intersection where Pinehurst and Skyline meet only there are 3 other roads that meet there, too and it was ugly and confusing only the guy was there, waiting for me! She pointed the right way and said, “just head straight down there!” How nice was that?! So thank you again Mr. VeryKind Cyclist. You made my day. Okay so the way I went up looks just about as steep as the way I went down but it isn’t – trust me. My time on this ride was 47 minutes faster than a year ago. Rock on. 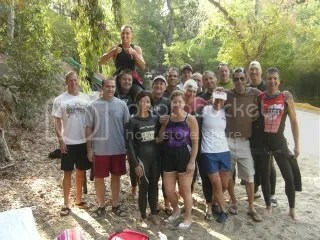 Sunday I swam with my race club at an open water swim clinic. It was both good and bad. I swam at a reasonable pace but I managed to introduce a whole new problem – cross over. This has never been a big problem for me before. Sigh… I have 2 more swims before Vineman and I’ll just have to straighten that out. On the plus side I test drove my sleeveless wetsuit and although the neck felt really tight at first I quit noticing I even had it one after a while. More bliss. After the swim I ran for 70 minutes and honestly I thought it would be horrible because my legs were tired. I didn’t really care, though which was a nice change of pace. Any run would be a good run as far as I was concerned. My pace was about a 10:15 which isn’t bad and I didn’t die which is great so mission accomplished! In conclusion let me just say – BRING ON THE VINEMAN! I’m ready. 11 Responses to Monday Monday – The Vineman Cometh! Nice brick!! And thanks for the bruise update!!! Running isn’t my thing either…but…we have to do it eh? Have fun at Vineman!! GO get ’em lady! I will be there in spirit for you gals! Have FUN! you are TOTALLY ready!!! nice that you’ll have help on the run. NOT THAT YOU NEED ANY HELP on the RUN! you are rockin’ everything! Congrats on the awesome solo ride. I would be so lost, I am impressed that you tackled it on your own. I swear runners and cyclists are about the nicest people on the planet. You are so ready for Vineman. Enjoy your last taper week! who wouldn’t be nice to you? you are going to have a great time. Give Andy some Sh*t for me. Go Pamela! You’re totally ready. Have a great time!